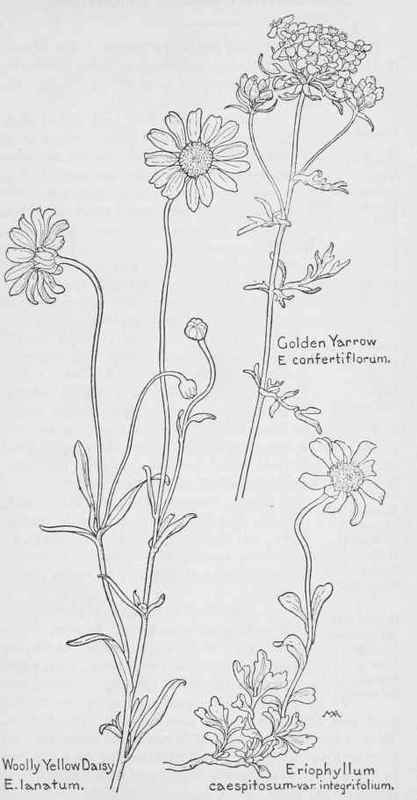 This forms low tufts of pale gray dcwny foliage, contrasting well with the bright yellow flower-heads, each about an inch across. This grows around Yosemite and in other mountain places, as far east as Wyoming, and has a variety of forms. This has small flowers, but it forms such large clumps that the effect of the golden-yellow clusters is handsome and very conspicuous, on dry hills and mountains and along roadsides in summer. It is woody below, from one to two feet high, and the leaves are mere or less woolly. The variety discoideum has no rays. There are many kinds of Anthemis, natives of Europe, Asia, and Africa.